Serving Toronto & SURROUNDING Area! As part of our commitment to providing convenient, quality service to our customers, Quick Draw is proud to announce its newest full service location in Milton, Ontario. Now Open! Contact us for details! Serving Norfolk & SURROUNDING Area! We've moved! Come see us at our new location and new building in Norfolk, Nebraska. 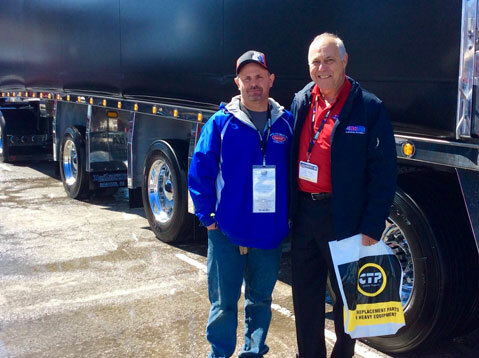 JLS Trucking is our April System of the Month. We were tasked with matching the paint and this is the result! 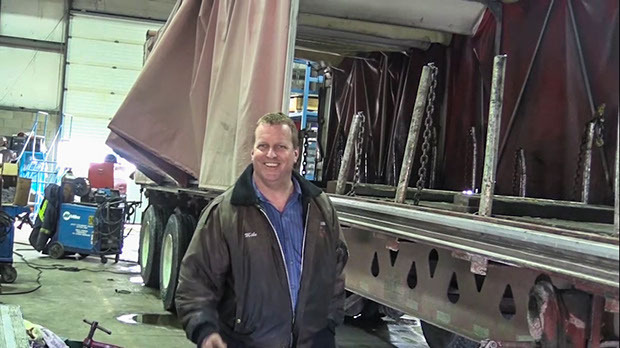 We have been pulling an aluminum flatbed trailer covered with a Quick Draw Tarpaulin System for approximately three years. The modular design is of premium quality and is very easy to operate. The tensioning mechanism is arguably the best in the industry. The durability of the Quick Draw Tarpaulin System has exceeded our expectations–withstanding multiple, punishing tests of all sorts of situations. To this day it has a ‘like-new’ condition and has required minimal maintenance. Many systems exceed a life expectancy of 10-years. 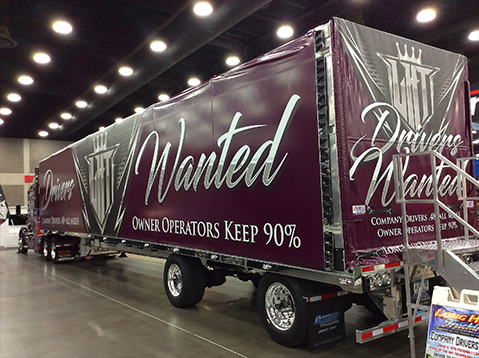 Quick Draw Tarpaulin Systems offer laser printing capabilities that turn any trailer into an affordable and effective rolling billboard, providing a revenue-generating opportunity with which to capitalize. When the time came for us to select a supplier for our Breaking11 rig, without hesitation we turned to Quick Draw Tarpaulin Systems. 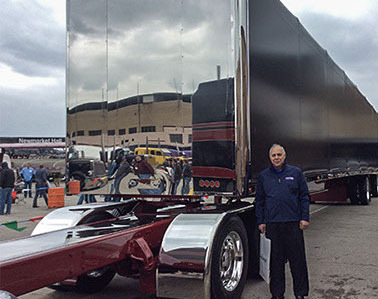 In working with the aerodynamic concept of our tractor/trailer, the staff at Quick Draw Tarpaulin Systems thought outside the box and bent over backwards to produce a system that varied in height with a significant arch at the top. 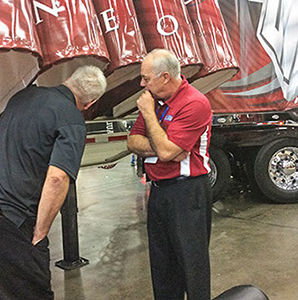 The system also opens in the middle, which when mounted to our low-ride trailer provides us with the ability to transport freight with a height of as much as 108”. 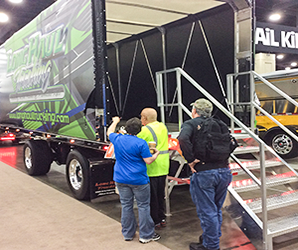 The contour of our tractor/trailer, primarily the arched roof of our tarp system, will contribute to our overall fuel savings by .3 to .5 mpg. Having the Quick Draw system has been a great asset to our company, it is so user friendly it makes the job go so much faster and safer for loading and unloading high end cars I was very pleased with how easy the system is to use ! great addition to our modern fleet! 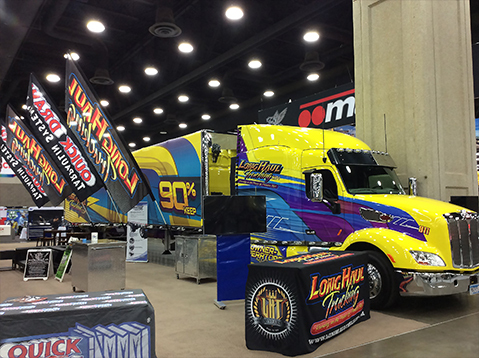 The people at Quick Draw did a great job on the installation and printing the graphics and Tim Bondy made sure I was 100% happy with everything, no surprise Tim droe in from Canada to meet with me to make sure all was OK. I have already recommended Quick Draw to some friends. 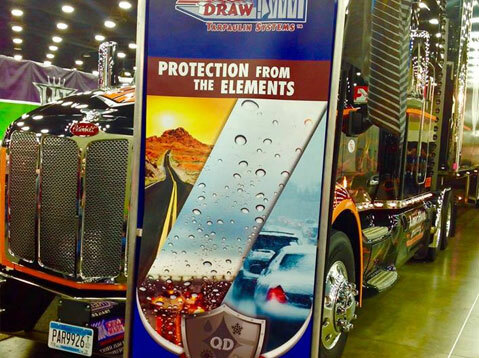 All good with the new Quick Draw, the fit and finish is great , the mechanism works great and Graphics came out great. 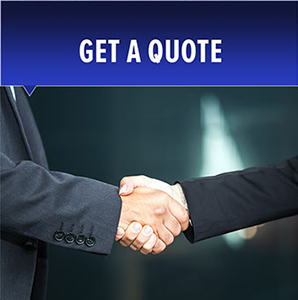 Very happy with everything you've done and the extra mile you went in after purchase service. I looked at alot of different curtain systems before I made my final decision. Quickdraw had the best setup with the wheels that run along the top of the track. The kit opens and closes very easily, and it's a great feature to be able to release the tarp tension from the front. Tims attention to detail was exceptional and his honest advice appreciated. Their customer service is great from ordering the kit to the timely installation. I'm very happy with my Quickdraw. I purchased my Quick draw about 3 years ago, I searched the market, talked with other drivers, then when I got it I could proudly display the fine art work you did. A drunk driver forced me off the road in Montana. I feel the construction of the headboard played an integral part in my survival. The headboard got pretty banged up but it stopped the cab from getting crushed. 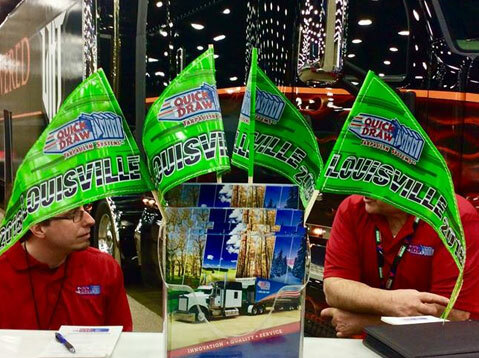 I would never buy a different tarp system, from the first time we talked you made sure I was 100% happy. When I picked it up in Norfolk, Alan and his crew did a great job. You guys are the reason I will be getting another Quick Draw. 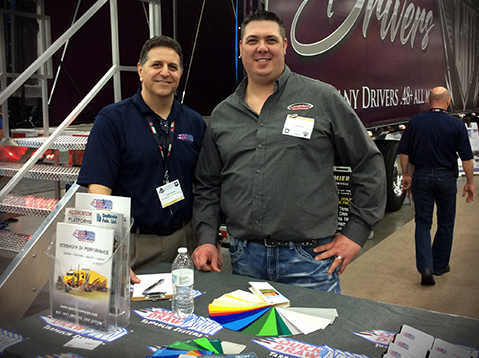 Thanks to everyone who stopped in to say hello last year at the Mid-America Trucking Show . 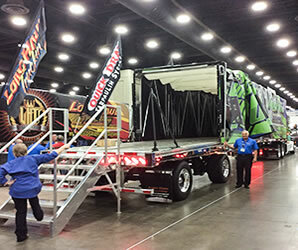 Thank you to Extreme Trailers, LLC Long Haul Trucking, Inc. and Kentucky Exposition Center. See you in 2019! 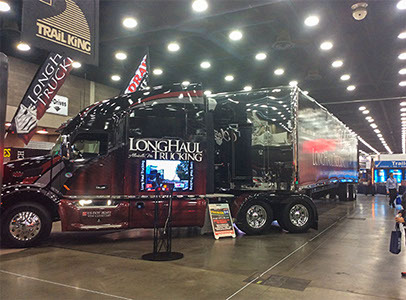 The Mid-America Trucking Show began in the early 1970's, when a private management group was formed by Paul K. Young, to create the largest and most diversified trucking show in North America. 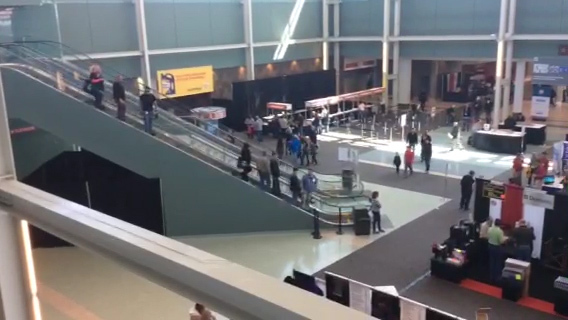 The first show occupied a portion of the West Wing of the original Kentucky Fair and Exposition Center. 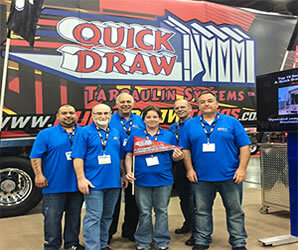 Once again Quick Draw Tarpaulin Systems & Long Haul Trucking's booth dazzled the crowd with their impressive display of the Quick Draw Tarpaulin Systems® Rolling Tarp System. 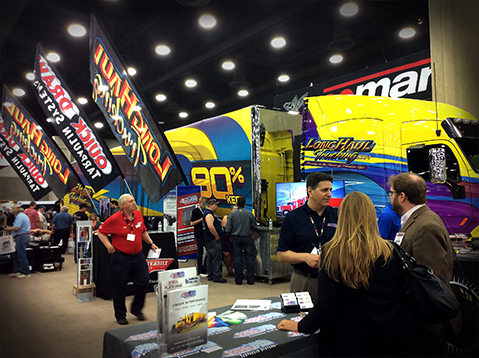 Guests were attracted to the booth from different ends of the world, spanning from Canada and the USA to Chile, and parts of Europe. 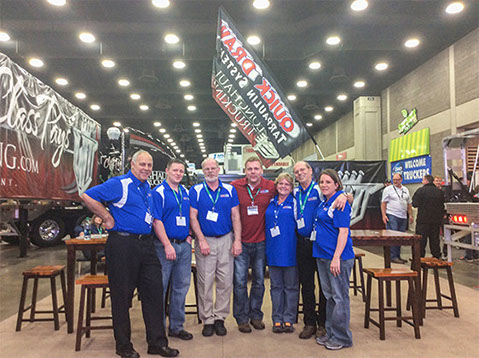 Everyone who stopped by the booth left assured of Quick Draw's longstanding product and market leadership. 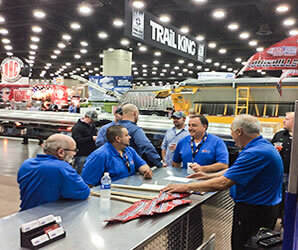 An add-on product for car carriers, the Quick Draw Tarpaulin System offers companies a chance to expand or enhance its premium-car towing and transport work. 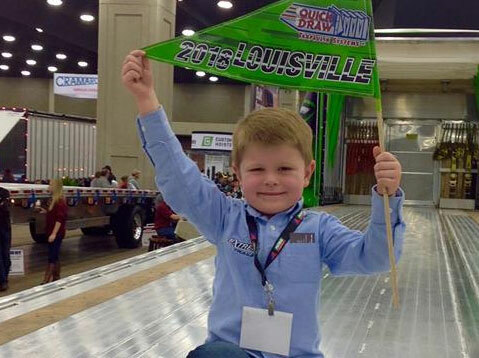 The Quick Draw tarps are a quality rolling tarp system for flatbed trucks. 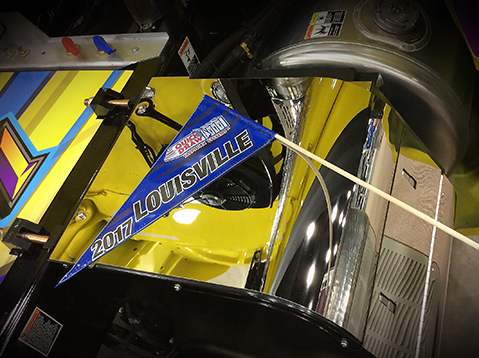 "Rolling it back and forth is a one-man job," said Jim Powers of Elizabeth Truck center in Elizabeth, N.J., a distributor for the product. "it only takes an extra two or three minutes to use." 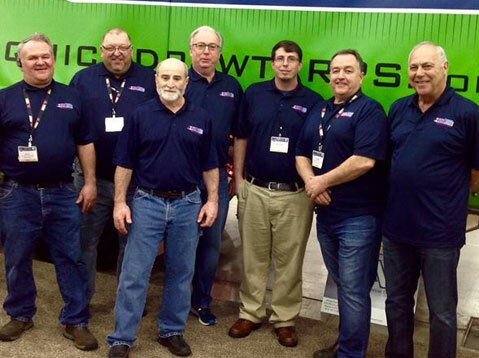 The track, wheels and framework are a time-tested design that ensures maximum replacement part compatibility and has customers praising a system that can last for over 10 years with minimal maintenance and repair costs, he said. Add the tarp to a carrier that won't be used primarily for high-end work isn't necessarily a good idea though. "You want to use it the majority of the time the way it is," Powers said. "You can use as a regular car carrier and that isn't a big deal, but you're adding the motions of sliding the canopy back and forth for no reason. ... The proper way to use it is rolled back and engaged." 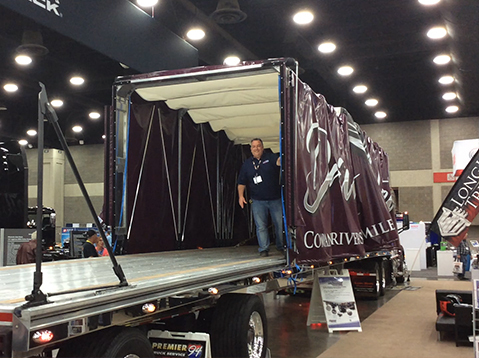 Powers said the Quick Draw Tarp System can be added to most car carriers, as certain specifications have to be met.